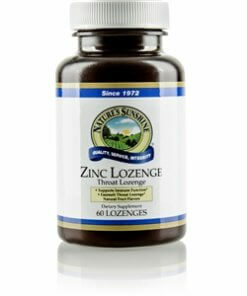 For those cold and flu seasons that bring on sore and itchy throats, Nature’s Sunshine Zinc Lozenge is just what you need to boost the immune system. Zinc supports healthy immune function and helps the body fight off bugs. Instructions: Take 1 lozenge each hour or as needed. Allow lozenge to dissolve slowly in the mouth. Do not use more than six lozenges daily. Sorbitol, Mannitol, Cellulose, Stearic Acid (vegetable), Natural Flavors (citrus, peach, tropical fuit blend), Guar Gum (Cyamopsis tetragonolobus), Magnesium Stearate (vegetable), Stevia Leaf Extract.